Wow, what a fun weekend of mountain biking. Saturday had me, Big Worm, Wrecking Ball and Spanish Mackerel loading up the truck and heading to middle Georgia for some mountain biking fun. First stop was the Boy Scout camp (Camp Thunder) near Thomaston. With well over 2,000 feet of climbing per lap, past trips on this trail have turned out to be more hiking than biking, but this time it seemed to be the opposite. It’s amazing what you can do when you settle down and just find a grove. Big Worm decided to do things the hard way. About 2 miles in, and during the second climb, he breaks a rear derailleur. So now he’s down to about 3 gears. This is not the place to limit your gear choices. Riding behind the big man you would never have known he had a problem. He rode all the climbs the rest of us made and cleaned some that we couldn’t. The Mackerel gave his best impression of a mountain goat while running his mouth during the climbs. Me and WB were devising a plan to toss him over a cliff while at the same time breathing through our eyelids. 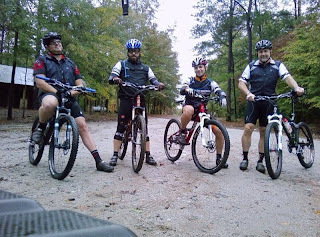 After the ride we head for Macon and try to find the big man a derailleur from one of the bike shops. After several calls it was not looking good as none had any level of Sram for purchase. As luck would have it, one of the wrenches offered to sale his XO off of his personal bike…..SOLD. So we get to the shop at closing time and the deal was done. Oh, and it must be said that Big Worm was “recognized” in the shop as a GSC participant. I made sure they realized that he was not only a participant but the GSC Clydesdale champion. After checking into the Hotel, getting cleaned up, and drinking a few beers, we head out for some Mexican food. Good stuff, and hey since we are not racing the next day (thank God) why not hit Baskin Robbins for some ice cream. Seemed like a good idea at the time. Back at the hotel there was mention of a ten o’clock run to Five Guys Burgers but, thankfully, cooler heads prevailed. Sunday we get up early and hit the free hotel breakfast before loading up the truck. Before heading to Dausset we hit Dunkin Donuts for some iced coffee and donuts (did I mention not a race weekend…THANK GOD). Off to Dausset we go. Unlike the day before, Sunday was gorgeous (sunny and cooler). The trails were a mess due to all of the rain days before. Very slick, and very muddy which made things interesting. Not even half way through the ride Big Worm, you guessed it, breaks another part. This time his saddle rails have snapped. He gives it a go for a while but decides he needs to head back to the truck. He hands SM the map, gives a few instructions and we part ways. Me, WB, and SM hit the “huff and puff” section of Dausset and struggle with the mud and water. WB was about to blow a gasket (bonked) and I’m having some “intestinal” issues (which I’m sure had nothing to do with the diet I enjoyed while on the trip). Overall another very fun ride. Load up the truck, stop by JB’s BBQ, then head to the house. I can’t wait for the next guy’s weekend (RACING NOT INCLUDED).